Hi there, how are you? I hope all of you are doing well and fine. I just came back from a wonderful Japan trip, great foods, great peoples and great shopping. In fact i wish my next trip will be going to Japan again ^_^. I took thousand of pictures, need some time to organize it and have it post, please hold for my update (I also will giveaway 3 items that i bought from Japan, please check it out later). I have not cooking up any new recipes after came back, so today i am sharing an old recipe. This sweet cream corn chiffon cake became popular after 鲸鱼 posted hers. 1. Hand whisk egg yolks and sugar till sugar dissolved. 2. 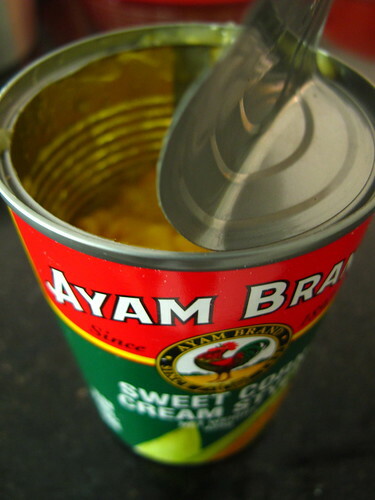 Add in corn oil and sweet corn cream, mix well. 3. Add in flour and combine well, set aside. 4. Beat egg whites over high speed till foamy ( 1min for KA mixer at speed 8). 5. Slowly add in sugar, beat till soft peak form (2-3mins for KA mixer at speed 6). 6. 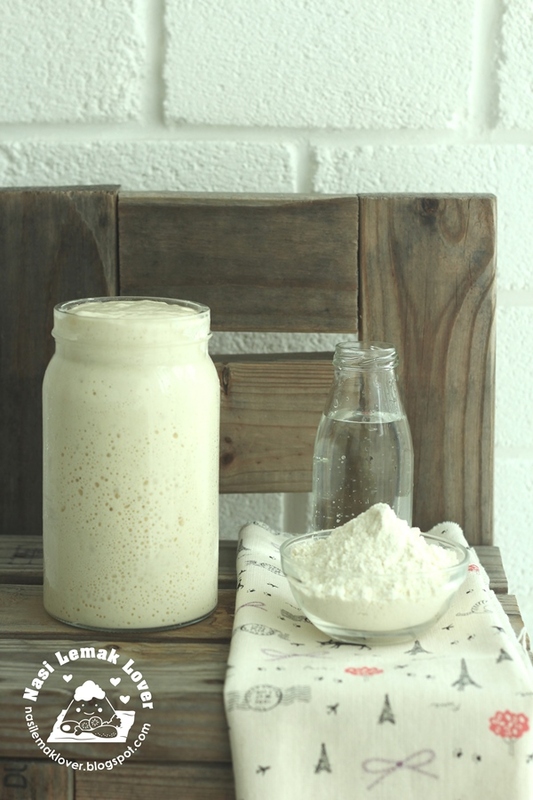 Take 1/3 portion of egg white mixture and use hand whisk to mix with egg yolk mixture till light. 7. Fold the balance of egg white mixture into egg yolk mixture, combine well. 8. Pour cake mixture into baking pan and bake at pre-heated oven at 160c for 40min or adjust to your oven as every oven is difference. 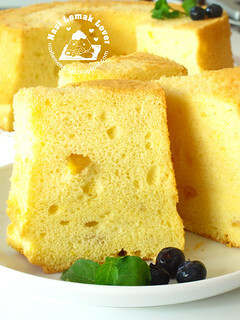 What a wonderful pics of sweet cream corn chiffon cake you have here. Hey !!!!!! So , how's the trip ?! 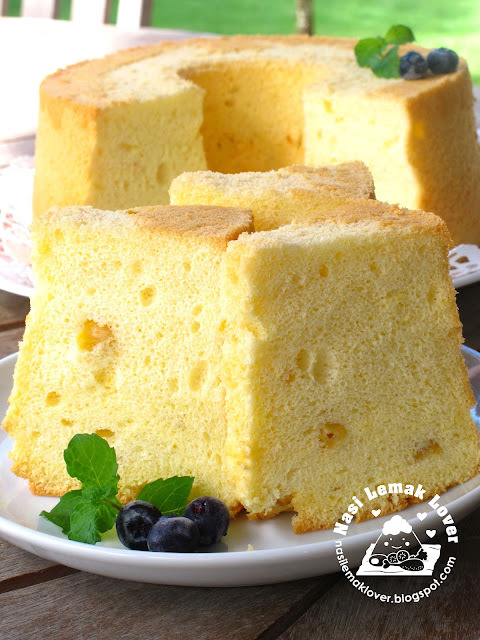 Anyway , that chiffon cake looks wonderful ! The sweet corn flavor sounds delicious ! Welcome home friend. You r rite this chiffon became very popular 鲸鱼 posted hers. I still see it quite often amongst the bloggers hehe.. Nice pic as usual. Great country, great foods and great shopping.. haha!! The cake is so light and fluffy. i can eat half of the whole chiffon alone. Woohoo welcome back! Hope to read about your Japan trip. Great to see your post again. I have never make sweet corn flavor chiffon and yours look so soft. Hope everything worked out. I heard it started to rain, and I hope it didn't bother your trip. Looking forward to your posts! Japan is a nice country ya... hehe.. Looking forward to see your update on Japan! nice cake and yes, I also look forward to seeing your Japan photos. Lately i am quite lazy to bake chiffon. I like yours. It looks very soft! Nice to have you back. I like this recipe. Sweet corn has a nice aroma. Look forwards to see your Japan photos. welcome back sonia and feel so excited as we are going to meet soon, hahaha, a bit kan cheong now. i'll keep u inform our itinery, see u then. Welcome back! I wish to go there again too...lol. I'm sure you must have a wonderful holiday. Looking forward to view all your beautiful photos. 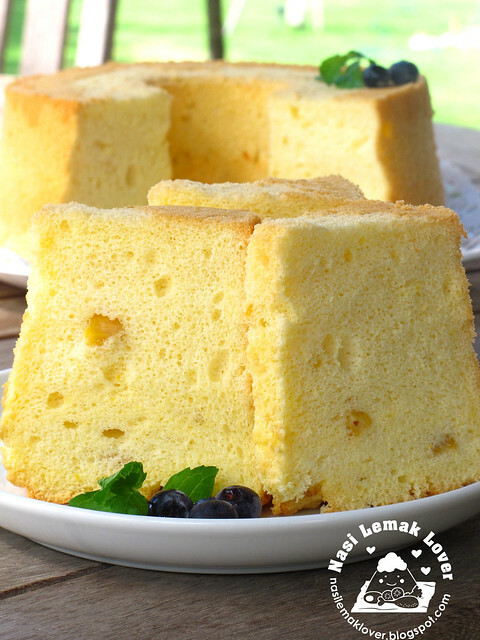 Chiffon cake is my favourite but yet to make this corn flavour. WOW... very fluffy... very nice colur... looks so sweet..
Ur chiffon is so tall and the texture is very nice. Welcome back! Great recipe to used up my leftover cream corn. Something new to me corn shiffon cake..
am a big fan of your baking recipes esp cakes,so soft & perfect!! Oh welcome back, Sonia! I'm really looking forward to your Japan posts =) This cake sounds so great, I'm a huge fan of corn..I think 'addicted' would be more fitting actually..haha. Will definitely try it one day. Thanks! Oh Welcome Back !! This cake looks lovely... and look forward to your pixs from japan ! hi sonia, beautiful texture of your chiffon! will be chking out your photos of the trip and also your giveaway! Cant wait for your update on your Japan trip. This sounds great. What a pretty and airy looking cake! Hi Sonia, the cake looks delicious:) I tried making it this morning and it tasted yummy, however, it collapsed after overturning it on the rack:( Would you know why? Welcome back, Sonia. Looking forward to what you're bringing back from Japan. Btw, you just tempted me to make this cake. I haven't been baking chiffon cakes for ages (probabaly more than a year!). Welcome home Sonia. So good that you don't get jet lag visiting Japan. I am still not back to normal sleeping hours yet. I have finally conquer the fear of making chiffon cake. Will definitely try making this one. Thank you for sharing this lovely recipe with us. Made it and posted the recipe in my blog with credit given to you. Love the cake. Thank you. I'm very grateful for your easy and almost "no fail" recipes. All these while, I fail to try baking chiffon cakes cos I couldn't get it right. Now, I'm confident after following your recipes and my cakes turn out light and fluffy. Thanks. Please continue to share more. Loan Tran, i can't really remember, but i think at that time i was using B or medium egg.